With dozens of species of sparrows, many with overlapping ranges and similar plumages, these small birds can be difficult to identify. At first glance, many sparrows look and act alike, and it takes practice and patience to learn their subtle differences. In time, however, any birder can become more confident with their sparrow identifications and won’t need to label each one as only a little brown job. Binoculars: Binoculars are essential for identifying sparrows in order to clearly see markings on these small birds. Choose a pair of binoculars with a wide field of view so you can easily follow moving birds. The lens should be wide enough to admit sufficient light for watching small birds in shaded shrubbery and other dim habitats. A larger magnification can help make even small markings easier to see. Field Guide: A good field guide is invaluable, no matter what types of birds you hope to identify. Choose a guide that shows different variations of sparrows’ plumage or that includes tips on challenging sparrow species in order to identify these birds easily. Neutral Clothing: Sparrows can be quite shy and easily spooked. To give yourself an opportunity to get closer to the birds for the best views, choose loose, comfortable clothing in neutral, natural colors. Avoid clothes that rustle or jangle excessively, as the birds will easily hear these noises long before you spot them. The easiest way to identify these small, active birds is by their field markings. Though markings are not always clearly visible, most sparrows have at least one strong field mark unique from other sparrow species. By finding and identifying that mark, birders can make a positive identification of the bird even without closer observation. Even if the bird has no outstanding markings, comparing two or three types of field markings will usually lead to a confident identification. Head: Is the head smooth and flat, or does the bird puff its feathers in a small crest? Are there stripes or markings on the crown, lores, eyebrow, cheek, chin or throat? Does the bird have a noticeable eye ring or eye stripe? Tail: Is the tail long or short in comparison to the bird’s body length? Are the outer tail feathers brown or white? Is the end of the tail smooth or notched? Is the tail held straight or cocked, or is it bobbed or wagged? Underparts: When comparing the bird’s chest, flanks and abdomen, are they plain, spotted or streaked? Is there a color wash over the bird’s body? Are the markings uniform or do they create a specific pattern such as a bib, vest or central spot? Wings: Do the wings show any barring, spotting or other patterns? If there are wing bars, are they broad, narrow or broken? How many are there? Bill: Is the bill large or small in relation to the bird’s head? What color is the bill? Are the upper and lower mandibles the same color? Is the bill sharply pointed or slightly curved or bulbous? With careful observation, birders can answer these field mark questions about any type of sparrow. When several questions can be answered, the bird’s identity will be revealed. While field markings are the best way to identify sparrows, it is not always possible to get a good look at a bird for a positive identification. Instead, other ways to identify the birds may be necessary. Range and Habitat: Even when migrating, birds prefer familiar habitats. When you find a sparrow that seems unclear, compare it to species typically found in the same habitat in that range to make proper identification easier. Song: Some sparrows have remarkably distinct songs that can make identification simple if you’re familiar with them. Listen to the pitch, speed, and tone of the bird’s song and compare it to recordings or song descriptions to help with identification. Behavior: Like any animals, sparrows have unique personalities. Some are very shy, while others are bold and curious. Some prefer to move in flocks, and others are solitary. When you see one bird, take a moment to scan for others and watch how each bird behaves. Compare those observations to field guide descriptions or your own experiences to identify the bird. One of the best things to do to identify sparrows properly is to be familiar with your local birds before heading into the field. 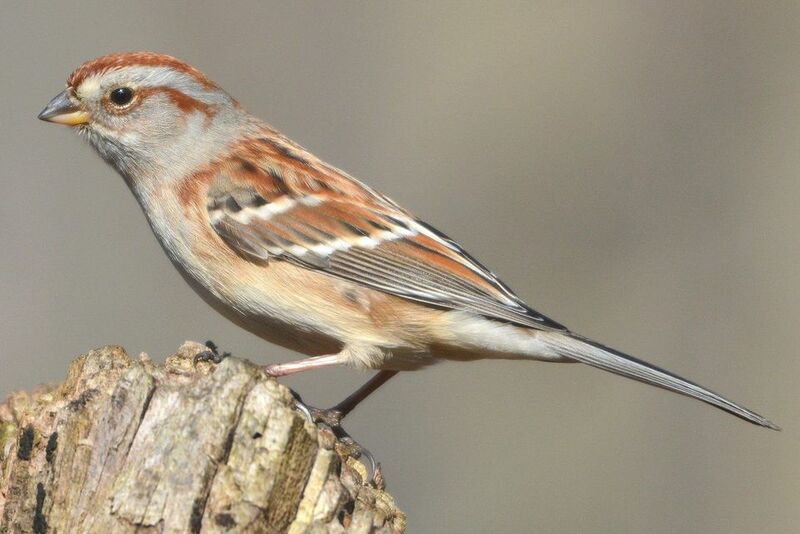 Study the pages on sparrows in your favorite field guide and note which birds you are likely to see and what you should look for in order to identify them correctly. The more familiar you are with what to look for, the easier it will be to notice the necessary characteristics about the birds you encounter. Above all, remember that it isn’t always necessary to identify every bird you find. Many birders use the term “little brown job” to refer to relatively bland, hard to identify sparrows, finches, wrens and warblers, taking note of the birds’ appearance even if the species is unclear. When you find yourself in this situation, just enjoy watching the birds, and eventually you’ll find that you’re able to identify them more easily simply because you’re familiar with them. What Kind of Duck Are You Looking at? Finches or Sparrows? Learn How to Tell Them Apart! Need to Identify Woodpeckers? These Tips Will Help!